The craziness of my week is going on as I am trying to finish everything before going to holiday. I hope your week is easier than mine and guess what? It is almost over, yay! Today I was talking to a colleague and said "Oh today is Friday, there is fish" and see it was only wishful thinking. Do you have the same effect, once you work too hard, you feel like it is Friday already at Wednesday or Thursday. 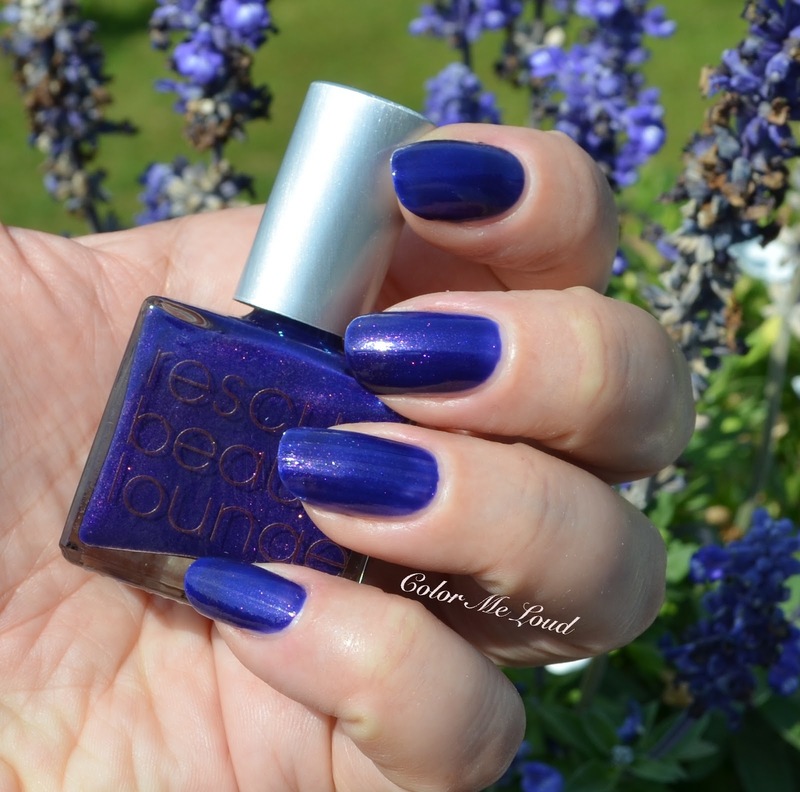 Yesterday I have seen that Rescue Beauty Lounge is having a free shipping worldwide. I believe it is only until tomorrow noon. Last time when I posted swatches of RBL, many asked me how to get hold of these in Europe. Rescue Beauty ships worldwide. It is $13.50 per shipping to Germany, so rather expensive if you are eyeing only one or two colors. So this is your chance if you have one or two shades in your wish list. A few of what I am about to show you may steal your heart! I would like to start with this gorgeous unexpected grey. 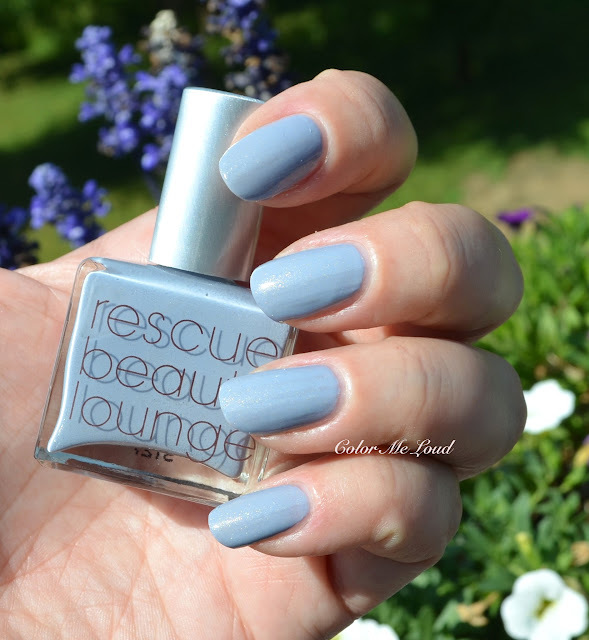 Rescue Beauty Lounge Morning Light is a periwinkle to grey color with super pretty golden shimmer. I like when the shimmer and the base shade are so different. In this case the shimmer is so warm and the base is so cool, they make a wonderful combination. 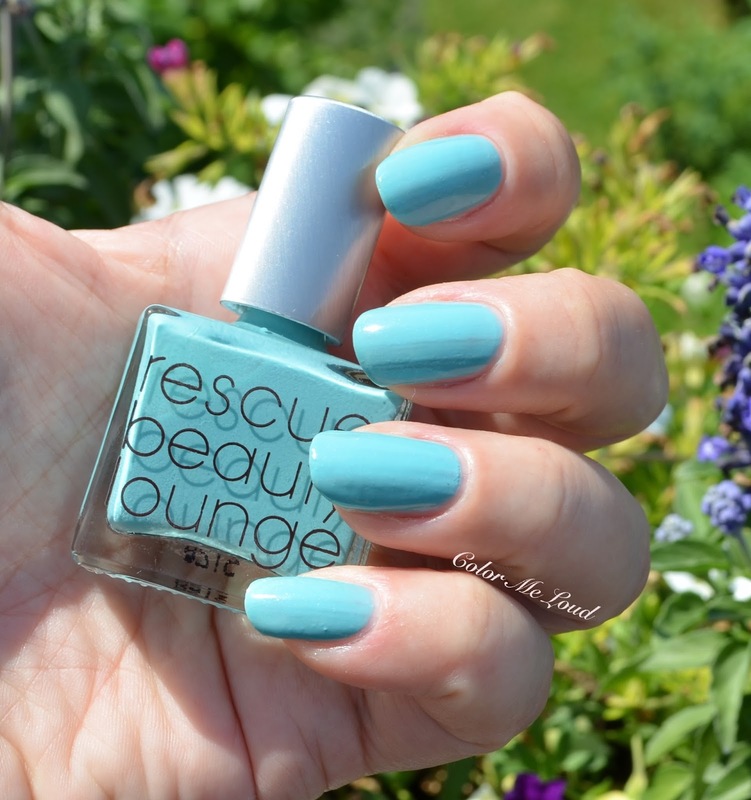 Rescue Beauty Lounge Morning Light has a nice consistency. Also the pretty golden shimmer does show up on the nails under the sun. It is even prettier in real life and I am loving the name of this one. In the photo I am wearing two coats. For the love of turquoise, this shade kills in a good way. Manicurator is a lovely turquoise with blue shimmer particles which makes it even more to die for. On my nails the shimmer doesn't show up all that much but it reflects as another dimension so makes it look like a more complex color. The consistency of this one is also very good. Here I am wearing two coats. It is perfectly opaque and applies easily. This time around RBL nail polishes lasted longer on me, so I don't know if the formula is a little different or if my nails are in a better condition. You can never tell. The next shade is probably my least favorite of the bunch. The base shade is very pretty, Makeupwithdrawal is a deep violet blue and the shimmer is reddish purple. My issue with this one is that the base has a jelly quality. Many like this type of finish but I find it a bit patchy once applied on longer nails. Also for opacity you have to apply more coats or two coats more generously, which is what I did below. Don't get me wrong, it is a beautiful shade too but on my nails it looked a bit less flawless than the other three. By the way, it is my humble opinion but I like when they don't give their blog names to the polish but something else. 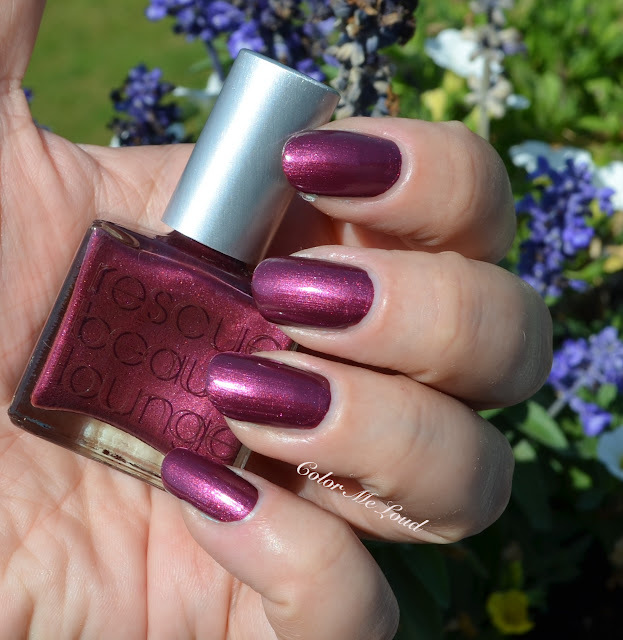 Now I have a color coming up for Rescue Beauty Lounge Fan 3.0 Collection and the name is not my blog name. I think one can be more creative than that. I love the name of the polish of Polish Police, which was called Liberty and it was a soft green, how lovely. I also think "Morning Light" is a beautiful name for the grey polish. But of course everyone is free to choose what they want. That said I refuse to write Peachypolish .com for the next nail polish name. Man, this is just too much linking. Too bad because it is definitely my favorite shade in this collection, look at this beauty! I thought maybe since it is not a peach polish, they wanted to make extra sure you don't get it wrong? I don't know. This baby is a one coater but I applied two coats. I love how it glows and that shade, it will be my staple for Fall! 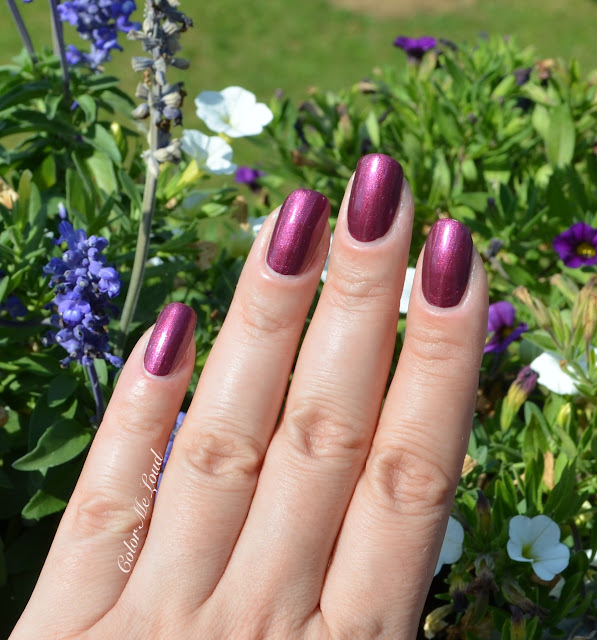 I can't get enough of this one and Dior's Fall polish called Cosmopolite (reviewed here). Although this one is metallic, it doesn't have any brush strokes and the consistency as well as the shade, I die! Final thoughts: My favorites from the collection are Peachypolish and Morning Light. My turquoise loving heart can't resist Manicurator either. All of these have great consistency and very unique pretty shades. I wasn't all that impressed with Je t'aime Je t'aime collection a few months ago so this definitely restored my excitement for RBL. As I mentioned in the beginning, right now there free shipping worldwide at Rescue Beauty Website (not affiliated). Hey Sara, you're almost there! Hang in there! This is a beautiful collection, and I love Morning Light and Manicurator especially on you! I've been having the same problem this week...on Tuesday I thought t was Wednesday, on Wednesday I thought it was Thursday, and so on. At least tomorrow is actually Friday, yay! I found this to be the most exciting collection RBL has done in awhile. I bought the same colours you did and they're all beautiful. I love peachypolish especially, and while I don't have a particular problem when bloggers name their polishes after their blogs, I do like it when they get a little more creative, like Orbis Non Sufficit from the first blogger collection. So today is your last day before vacation? This is a great day then! you made it :) I don't know this brand, what is special about it? I would like to try Kure Bazaar, their green colors look amazing. Peachypolish looks gorgeous on you, and it reminds me of Michael Kors Cabaret. I was planning to go on-line today and look for Ah, Oui, a unique periwinkle. Also loooove Morning Light, but one of the RBL bloggers describes the shimmer as "micro-glitter" which I am not that enthused about. Also noticed that Orbis No Sufficit is in the sales bin, a tip for dark green lovers. More Hunter than Dior Metropolis. those days when you think it's friday but then it's not are the worst! I've had weeks where I thought it was friday everyday; awful! 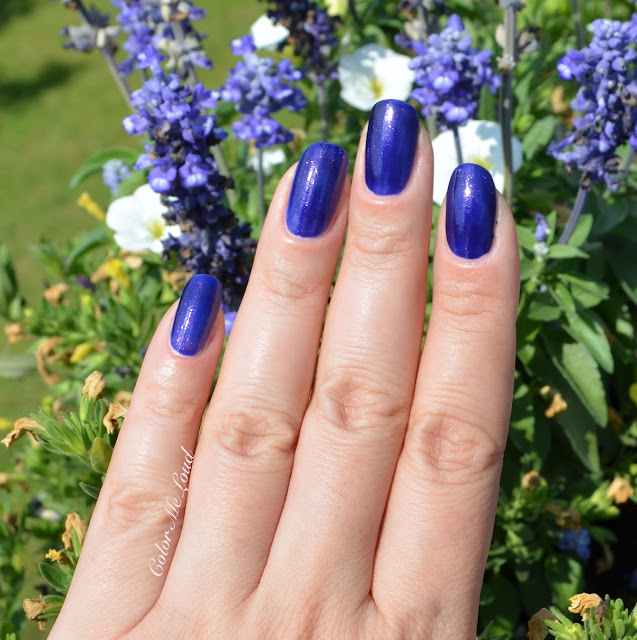 I've been eyeing this line of polish for a while as they have some truly gorgeous shades! Morning Light is screaming my name! If you create that shade, make it a beautiful yellow. I am writing from vacation right now! Not everything is done but I managed to finish a few important things. It is crazy, I only have a few days left when I am back. Thanks so much for the support. You get another vote for Peachypolish from me. Gorgeous shade for sure, very similar to Marc Jacabs Wine Not (my all time favorite color). I wish you the very best on you holiday. I see that this is an old post, I just stumbled upon it. Just thought you should know that what you attribute to a lack a creativity - naming polishes after blogs - was actually specified by Ji. There was really no reason to be unkind i.e." I think I can be more creative than that." when you have not been in the same position working with the polish maker. Hey, it was not meant to offend anyone, just my plain thoughts. I created a polish with Ji, named it "Golden Horn". No one knows it is my idea, probably because of the name but yeah, I'd rather not give the blog name but then there is no branding. It is simply a choice. I love your blog, again didn't mean to offend.